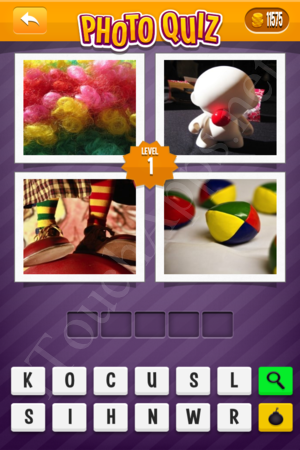 Please scroll down to find links to all answers of “Photo Quiz”, an ios game by Apprope AB. Photo Quiz Hard Pack Answers: Level 20 – MEDUSA – A snake (reptile), a statue of a naked man holding a woman’s head and a sword, person wears a bandana, ? Photo Quiz Music Pack Answers: Level 3 – BIEBER – Black and white photo of a boy, a keyboard, white berries, autumn (red leaves). Photo Quiz Music Pack Answers: Level 20 – FIFTY CENT – Club lights, view of a city building, change (coins), ? Photo Quiz Usa Pack Answers: Level 17 – REAGAN – Gold man (statue/robot) on a stage, white masks (scared/crying), Ronald McDonald’s statue, ? Photo Quiz Denmark Pack Answers: Level 13 – PYRUS – Red electric guitar, lawn gnome, kids calendar, hiking sticks? Photo Quiz Arcade Pack Answers: Level 31 – RHINO – Flag of South Africa, iron (metal) uniform of a knight, a necklace, ? Photo Quiz Arcade Pack Answers: Level 43 – HEDGEHOG – A shield, pile of white nails, thorns/spicks, a fruit? Photo Quiz Arcade Pack Answers: Level 75 – CLEOPATRA – Coliseo Romano Fotos (gladiator arena), snake, statue of a man (chest-up), ? What’s the answer to level17 who am I?